Rapid increases in energy consumption and emphasis on environmental protection have posed challenges for the motor industry, as has the design and manufacture of highly efficient, reliable, cost-effective, energy-saving, quiet, precisely controlled, and long-lasting electric motors. Suitable for motor designers, engineers, and manufacturers, as well as maintenance personnel, undergraduate and graduate students, and academic researchers, Mechanical Design of Electric Motors provides in-depth knowledge of state-of-the-art design methods and developments of electric motors. 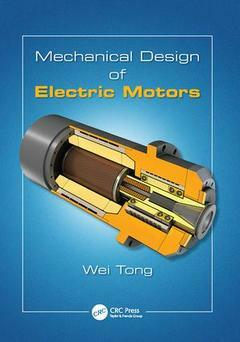 From motor classification, design of motor components, model setup, and material and bearing selections to power losses, motor cooling, design integration, vibration, and acoustic noise, this comprehensive text covers the fundamentals, practical design and design-related issues, modeling and simulation, engineering analysis, manufacturing processes, testing procedures, and performance characteristics of electric motors today. Featuring research results from the author’s own personal experience and the significant contributions of others, Mechanical Design of Electric Motors highlights innovative and advanced electric motors developed in recent decades. Engineers, designers, and manufacturers in the motor industry, as well as maintenance personnel, graduate and undergraduate students, and academic researchers. Wei Tong, Ph.D, PE is chief engineer at Kollmorgen Corporation, a subsidiary of Danaher Corporation, Radford, Virginia, USA. He is an internationally recognized expert on mechanical–electrical–thermal systems. A fellow of the American Society of Mechanical Engineers and a registered professional engineer in the state of Virginia, USA. He presently serves as an associate editor of ASME Journal of Heat Transfer and International Journal of Rotating Machinery.